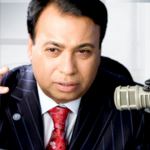 Home > Blog > Investing Tips > What are REITs? You’ve most likely heard the term “REIT” before, since it’s constantly being thrown around in the industry. But you may not be aware of its meaning. 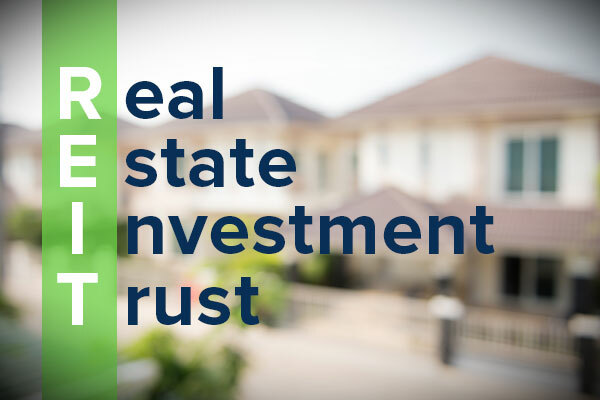 A REIT, or real estate investment trust, is a company that owns and traditionally manages real estate. From commercial to residential, a REIT can involve many different types of real estate, like office buildings, shopping malls, apartments, hotels, and more. It acts similar to a mutual fund with one major difference – it’s backed by a physical income-generating asset. The basic concept behind a REIT is that a company pools capital together from multiple investors or resources to purchase real estate assets under one large trust. The REIT company then generates revenue by developing and operating the real estate assets as part of their own portfolio. By leaving the buying and managing part of the real estate investing process to the company, REITs are considered an attractive asset class by individual investors who can now invest in large-scale real estate projects without having to put down a large sum or have to do all the hard work of management. The downside is that you have less control over the performance of the REIT, as the success of the REIT is closely tied to managerial decisions made by the company executives. The investor makes profit with REITs monthly or quarterly by receiving a dividend from the REIT company. This means the total profit of the REIT is dispersed among all shareholders after expenses and fees have been taken out by the company. There is also upfront fees that you must pay to the broker or financial advisor, depending on who handles the transaction. These fees are typically higher in comparison to other asset classes, and takes away from the value of the investment. According to Investor.gov, the sales commissions and starter fees typically cost 9 to 10% of the investment. REITs that are traded on the stock exchange are known as publicly traded REITS; this means anyone can buy shares or units. On the other side of that equation are non-traded REITs that are registered with the SEC, but are not publicly traded. Non-traded REITs come with different risks than publicly traded REITs, such as lack of liquidity and transparency. You have to do your due diligence and thoroughly research the REIT company before you invest. 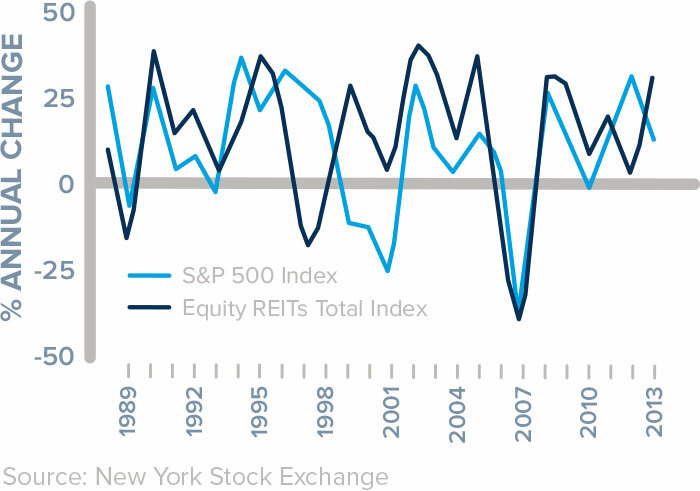 Additionally, REITs have historically moved alongside the dips and swings of the stock market. Tied to market interest rates, REITs are not considered an asset class that is a true diversification from the stock market. This means that if your portfolio consists of REITs, it is at risk every time the market takes a dive. To protect your portfolio, it’s recommended to add assets that diversify away from the stock market like residential rentals. There are many differences between REITs and owning residential rentals; one of the biggest differences is ownership. With a residential rental investing, you own a physical asset and therefore have more control over it; you and only you make the decisions when it comes to your investment, profit, buying and selling options. This ownership also diversifies you away from the stock market, since the property you own has inherent value and demand, as people always need a place to live. 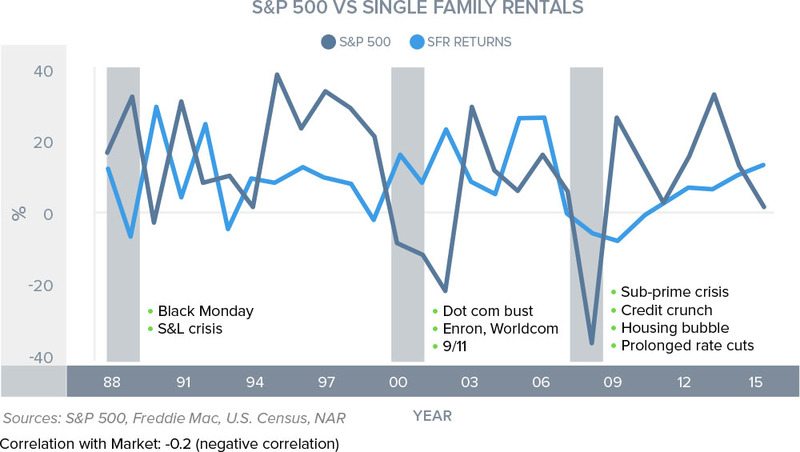 You can see the diversification relationship between the housing market and the stock market by looking at historical performance; even during major negative fluctuations in the stock market, the housing market has remained relatively unaffected or performed better. REITs or Residential Real Estate – Which One’s Right for You? 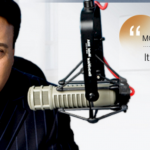 It ultimately comes down to your investment goals and what works best to help you achieve them. For many, owning residential real estate has shown to be an ideal way to diversify away from the stock market; use leverage to purchase multiple properties across a variety of markets, which carries less risk of vacancies; and gain the tax benefits that aren’t otherwise available with REITs. If you’d like to learn more about the benefits of real estate investing, please call us at 888-276-0232 or schedule a consultation.